This is a counterpart to the "Mapping Help" thread. If you need help with QuakeC coding, or questions about how to do some engine modification, this is the place for you! We've got a few coders here on the forum and hopefully someone knows the answer. I figured it out. It uses the entity as the start point regardless of the co-ordinates passed. And this is why the lightning beam starts at the origin of the player, regardless of anything else. beams last 0.2 seconds. QC respawns them every 0.1 seconds. the entity argument is just there to avoid the resulting double-beams issue (trying to depend upon precise timing would be too unreliable with network latency etc, hence why they last longer). Using world would break when you have two players firing beams, although some engines do understand world to mean 'don't replace any beams'. tbh 99% of the time that entity arg will be self. ignoring the startpoint and using the player's position is just to smooth things out so that the player doesn't leave the beam behind when moving sideways etc. note that there's already an engine extension to provide those as builtins (with that name), so beware of potential conflicts if a modder uses *extensions.qc. W_FireLightning Start Origin Incorrect On Players? this is especially obvious when shooting from RL window on DM3 and aiming at someone on the lower bridge. The original is "waist lightning". Darkplaces has specific settings to let you pick which style you prefer, waist or gunpoint. That only fixes the position of the bolt VISUALLY, which is what Spike was explaining. The above fixes the tracelines/damage as well. Still taking baby steps into QC with very little coding background. Wanted to check with experienced coders. This bit of code makes a trigger_push silent with a spawnflag. It appears to be working fine in game and no errors in FTEQCC but I feel like the syntax is still wrong. Next steps will be to learn how to toggle it and add custom sounds. You could also check the spawnflags in the spawn function and only precache the sound if needed. Quakedroid would be about the only reason not to just precache everything. rand() returns a number between 0 and RAND_MAX. &3 truncates all but the lowest 3 bits (so a random number between 0 and 3 inclusive). ==1 gives you a 1-in-4 chance of being true. and there's no closing bracket, so the entire thing is a syntax error and won't even compile. of course, rand's randomized bits are generally least reliable in the lower bits, so the above might be quite predictable, but it depends upon the rand implementation. I guess that makes (rand()&1) evaluate to 50%ish chance. lowest 2 bits, sorry. and yeah, bitwise and. movetogoal is just all kinds of screwed tbh. its very much an attempt to replicate doom's monsters, but in a way that's 5+ times as expensive due to all the floor checks etc. it can't slide along walls so can't deal with narrow passageways, etc. it works well enough, but its far from ideal. Its strung out multi-function calling madness yes. Trying to recreate it. Which Coordinates Do I Use For ReMStud? So I got the save file and the console output, but I can't seem to find the correct coordinates for putting the camera in one place and a place to view it. What set of coordinates do I use for the 3 sets I'm given from the console output? Not sure it is what you're aiming, but in a mapeditor with a viewscreen it is easy to turn the view camera and the info_camera aligned. Just make sure the arrow of both viewpoints are the same. Here is a rotfish fix I knocked up for otp. It fixes the fish count, makes fish gibbable, makes them non-solid straight away when dead, and includes a fixed fish.mdl due to the bugged head size in the death frames. It's all combined in a pak2.pak so it can be used as an id1 fix if you drop it in there. Source is included, only fish.qc and monsters.qc have been modified however. This makes the laborious task of hand creating a .DEF file a thing of the past, as long as you include the relevant entries in your QuakeC sources when adding or amending entities. While not as powerful as .FGD files, .DEF files have a place and can be a quick way to add map editor support for your new mod! Source code is included as a simple .c file, which should build on any C99 compiler. Oh!! That's what those hideous comment blocks are. I figured it was just a way for someone to copy and paste it over into some wierd editor definition in case they lost it. It sounds cool but I still don't understand the use case. What other formats are there other than .def and .fgd? The use case is that the original QuakeEd (that id developed and used on NextSTEP to make the original maps) parsed the .qc files and used those definitions to display what entities were available. The modern use is that all the entries can be stuffed in a .def file and trenchboom (etc) can use them to populate the entity list. I'm not aware of anything other than .def and .fgd, but maybe there are other formats in use in some of the more esoteric editors. This is a bit of a tautology - the reason those comment blocks were there was so that ID could write the .def file inline, and then extract it into a single file using a command line tool. The comments don't do anything for the QuakeC processing of the file. You're basically saying you can take all the effort out of writing the .def file, so long as you've already written the .def file. Thats true however I think the original QuakeEd read the QC files directly at launch and there never was a tool to pull the definitions out into a .DEF. I may be wrong though. I have a problem with edicts piling up that have no information other than Think = SUB_Remove and Time = -1. I'm not sure where to look in the qc to find what's causing it. Do TE_STREAM_* ents look like this in the edicts dump? Hi Shanjaq. TE_STREAM_ things aren't using up your entity slots, "temporary entity" is just a bad name for them. So the problem must be elsewhere. Can you post the full lines of code that these quoted parts come from? It's hard to tell if they're right or wrong from what you posted. ent.nextthink <= 0 means the entity will never think, and thus never get removed. use 0.1 instead, or something. note that the remove builtin will also set nextthink=-1, clear classname+model, but not clear the remove builtin. those removed ents will be reused later (no sooner than 0.5 secs). so if you're spawning+removing within the same frame then you're going to have at least 0.5 seconds worth of them building up. qc can still read+write removed ents (unfortunately), but nextent+find+findradius won't find them, and saved games shouldn't list them so I've no idea if this is what's causing them or what - how are you seeing this list of useless ents? What is the statement to catch this error? Usually just self. This is used to differentiate between the projectile inflictor (e.g. the rocket, self) and the attacker (self.owner). WAIT WAIT...just attacker and damage. AD adds inflictor. Most errors are fading, when I changed it in an addon monster, but it still keeps errors. They're not major but when I try to change athe Vore's pain it loops back to the self.th_pain string. And for Shub's error I can't find a pain function, but SUB_Null. I had changed my defs.qc into .void(entity attacker, float damage) th.pain! It needs to be that way, so it's the other way around. I think fte looks for more loose ends than I thought, while it still passes the progs.dat. Strange that doors.qc with its self_pain error. Such casts are generally not recommended as they'll not catch any future changes to your 'foo_notquitepain' function, and you should only ever ADD arguments to the rhs when casting functions (removing/changing args results in the function getting gibberish for the args that were not passed, or passed as the wrong type). Such explicit casts should always be seen as a claim by the programmer that they know that the result will be safe despite its inconsistencies. The vanilla qcc just saw function types, and didn't bother to validate the return types nor parameters. whereas fteqcc is somewhat annoying and warns about any inconsistent code that it sees. Its worth noting that the vanilla qc code is inconsistent but not otherwise buggy. You could fix it purely using casts if you wanted to, but its cleaner to just add the extra args. And yes, there is some door or trigger or something entity that mixes up touch functions and pain. You can fix that occurrence with a wrapper, but a cast will perform better - not that its significant enough to matter at all. Thanks for the info, that keeps me going! I'm trying to make a new monster, that shots nails and launches rockets. When I run the qc the monster shoot nails and launches rockets at a low angle, half from bottom. Also the two actions bump at the same time and I have no idea where to look. Where is the statement that give more time between the actions? As long as the player is running the relation between missiles and nails is almost even, but when it is tricked into a corner the thing blasts missiles every 0.5 second. That's no way of surviving, I know it is called Terminator, but unlimited charge is no fight. ...half from bottom... try changing the offset amount from '0 0 10' in TermMissile to higher amount such as missile.origin = self.origin + '0 0 24'; or try copying the value you used for org in LaunchZhaser if you want the missiles to fore from the same place as zhasers do. missiles every 0.5 seconds you have melee set to fire missiles. If you stay back away then he will only shoot zhasers. Maybe if you want more delay add more frames or add an attack_finished check. What do you mean bump? and as far as I can see the v_foreward sets the space that messures the armlength foreward, and v_right is the distance from the entity to the right sideways. I'm looking for the space upward, as a terminator that launches from under the belt is a bit odd. In game it is not so pronounced as with testing. I will try your statements in the hope they lead to a better result. For sofar here is the map as far as I have finished it. The scr file is included. I've played the map myself only, and I think the gamepath isn't realy clear. Hi madfox, have you tried using v_up? That's the "upward" vector I think you're after. @-Qmaster Changing the self.th_melee = atka1; worked for splitting the attack in two different shapes. Although I don't see the reason why self.th_melee = sknt_melee won't work. @-Preach : sure, but I can't find the place for the statement. Whatever I add or change it seems 7up for the compiler. missile.origin = self.origin + '0 0 10'; is the place to look I think? That's the right line to modify, keep playing with it until you get an effect you like. missile.nextthink = flytime + time;. Yeah, that would be the problem. Notice how both lines are setting the value of the same thing - missile.origin. The second line completely overrides the first one, like changing your order in a restaurant - you don't get two meals, you just get the second one. 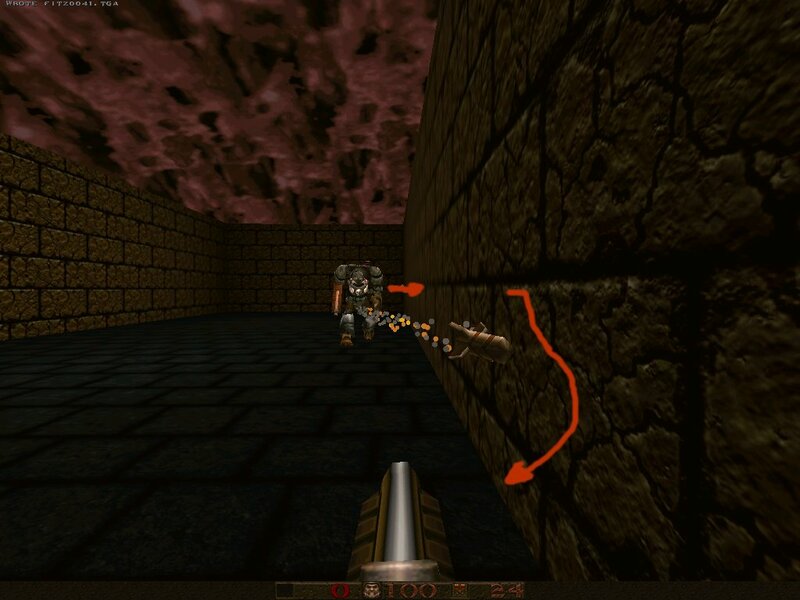 returns a launcher that shoots from the launching point left above the player. returns a missile that explodes left of the player. I'm thinking I'm changing the end point of the missile hitting the player. It launches from the right point, but it ends up blind. Also the negative parm comes out strange. It's not left handed? I used the enforcer_laser methode to launch the missile. This way it is the simpelest way to compile for the wanted use. The code was from the Orb, and I had a hard job on coding the weapon. You have IT_NO_WEAPON replacing IT_EXTRA_WEAPON in the code. However, I'm not sure how to implement this in a map. Not seeing a spawnflag or other way to enable it. Is there a way to trace a volume similar to traceline? I need to find a volume that is not occupied by players or monsters of any size. maybe something like traceline? any decent engine will have a tracebox builtin for things like that. failing that, you can also exploit quirks of droptofloor or walkmove(typically with FL_FLY? ), but these are much more limited and may have additional engine-specific quirks that break your mod (at least in DP). Is there any way to attach colored lights to projectiles or explosions via QC? a trail particle effect with 'lightrgb' and 'lightradius' set should be able to provide coloured dynamic lights, but it might only be with flashblends. I don't think I actually got around to testing it properly. point effects will additionally need lighttime, and probably want at least one of lightrgbfade+lightradiusfade. there are additional light properties, but those are specific to rtlights, which are definitely not supported in qss. What's the most reliable way to detect if the player is on a slippery slope (mostly vertical angle)? I'm using QuakeSpasm-Spiked. you could instead use traceline, but it would not match the player's physics so well. Thanks, but the most difficult thing about it is detecting the exact moment when the player touches/lands on the slope. AFAIK the engine doesn't set FL_ONGROUND for it, and assigning .touch functions to players doesn't work properly. Is there a way to achieve something similar to DP's (and Makaqu's) .glow_size in QSS, through QC? More specifically, negative dynamic lighting with custom radius and intensity, tied to an entity. I've seen some ways to customize lighting effects in qsextensions.qc, but there's no way to change their properties and make them move around dynamically. Also, I would like such negative lights to affect only BSP models, without affecting MDL, SPR and particles.